The Trans-Mongolian Railway follows an ancient tea-caravan route from China to Russia and connects Ulan-Ude, on the Trans-Siberian railway in Russia, with the Chinese city of Jining. The weekly Trans-Mongolian train (train 4 eastbound, train 3 westbound) leaves Moscow for Beijing every Tuesday night. The 7,621 km (4,735 mile) journey takes 6 nights. Westbound, it leaves Beijing every Wednesday morning. 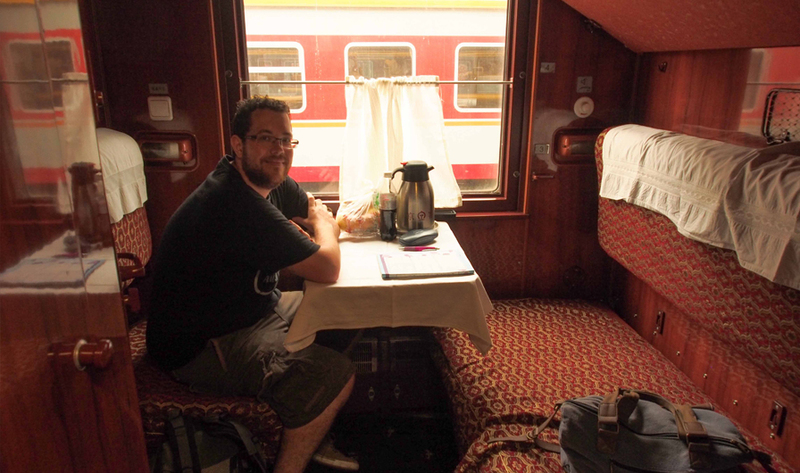 On the Russian internal trains there are normally 3 classes: 'spalny vagon' 2-berth compartments, often described as 1st class, 'kupe' 4-berth compartments, usually described as 2nd class, and 'platskartny' open-plan dormitory cars, sometimes described as 3rd class. Kupe is the way most travellers go, and can be considered the normal class of travel. Spalny vagon gives you much more privacy, with 2 people instead of 4 in the same size compartment, but it costs twice as much. Within Russia, the trains are remarkably punctual. However, on international trains you should expect an hour or two delay when crossing frontiers. 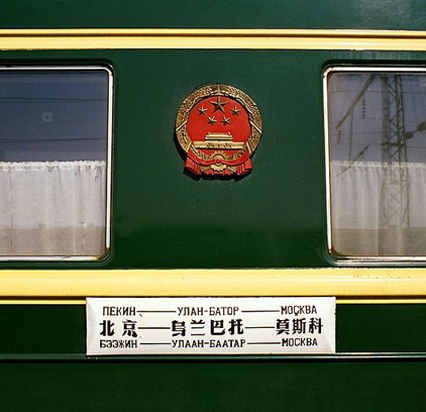 Train 4 is a Chinese train, each carriage proudly displaying a destination board marked "Moscow-Ulan Bator-Beijing". You'll find plenty of westerners on board, with a party atmosphere all the way. The food isn't exactly gourmet, but it's filling and inexpensive. Station traders sell biscuits,sausages, chocolate and other foodstuff on platforms along the way. The train stops at a station every few hours, long enough to stretch your legs, buy something from the station traders or stalls, and take photographs. But not long enough for a tour of the town, so stay close to the train! The train crosses the boundary from Europe to Asia in the Urals at kilometre post 1,777, some 1,111 miles east of Moscow. 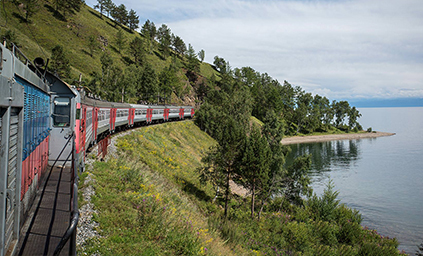 On day 5, the train rounds Lake Baikal, at times, the train runs right by the lake shore. You'll see endless birches in Siberia, and villages of little wooden houses. There are occasional glimpses of onion-domed churches and much of Siberia's heavy industry. In Ulan Ude train 4 swings south off the main Trans-Siberian line onto the Trans-Mongolian route. You enter Mongolia at Suche Bator. There are passport formalities carried out on board the train. Welcome to Mongolia! The scenery changes totally. You wake to grassy steppe covered in early morning dew, approaching Ulan Bator. The train now crosses the wide open spaces of the Gobi desert. Watch out for 'yurts' and camels The train first spends an hour and a half at the Mongolian border point Dzamin Uud, then crosses to the Chinese border point, Erlan (also spelt Erlyan or Erlian). Welcome to China! Once again, the scenery changes completely. You're now crossing the mountains of northern China. Watch out for glimpses of the Great Wall of China in the distance. On day 7 arrival in Beijing. Journey's end, at Beijing's main station, 6 nights and 4,735 miles from Moscow. Your arrival may be on time, but can sometimes be an hour or two late if the train has lost time at the border. In Ulan Ude train 4 swings south off the main Trans-Siberian line onto the Trans-Mongolianroute. You enter Mongolia at Suche Bator. There are passport formalities carried out on board the train. Welcome to Mongolia! The scenery changes totally. You wake to grassy steppe covered in early morning dew, approaching Ulan Bator. The train now crosses the wide open spaces of the Gobi desert. Watch out for 'yurts' and camels. The train first spends an hour and a half at the Mongolian border point Dzamin Uud, then crosses to the Chinese border point, Erlan (also spelt Erlyan or Erlian). Welcome to China! Once again, the scenery changes completely. You're now crossing the mountains of northern China. 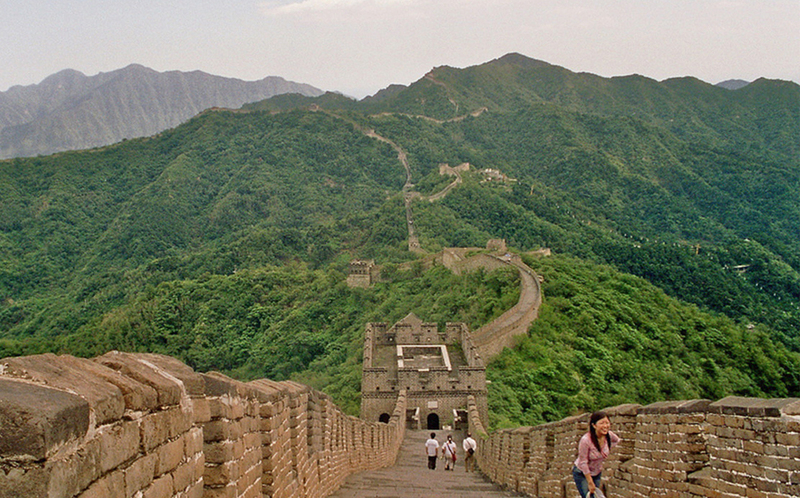 Watch out for glimpses of the Great Wall of China in the distance. On day 7 arrival in Beijing. Journey's end, at Beijing's main station, 6 nights and 4,735 miles from Moscow. Your arrival may be on time, but can sometimes be an hour or two late if the train has lost time at the border. All the main Trans- Siberian trains have a restaurant car, but sometimes it’s better to have non-perishable food at hand. Don't forget that on almost all Trans-Siberian trains unlimited boiling water is available free of charge, so remember to bring a mug, spoon, coffee and a selection of cuppa soups. You read, watch the scenery, go to the restaurant car, sleep, meet people, play chess, drink tea, drink vodka, get off at station stops and take photographs.... You are unlikely to be bored. It is the capital of Selenge Province in northern Mongolia, on the Orkhon river. 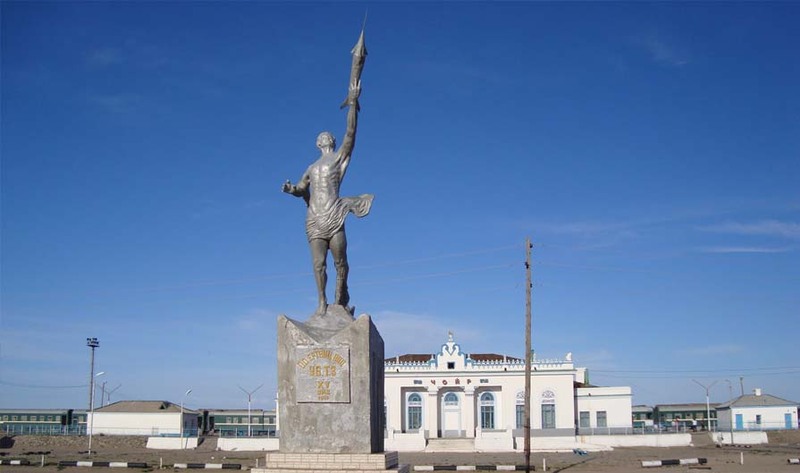 The city was founded in 1940 and named after the Mongolian revolutionary leader Damdin Sukhbaatar. Enshrined as the "Father of Mongolia's Revolution", he is remembered as one of the most important figures in Mongolia's struggle for independence. The museum of Selenge aimak (region) is situated in Sukhbaatar. It’s devoted to Mongolian indigenous community called Selenge. Here you can learn the history of Selenge community, the city art and architecture. The building of the museum is bowl shaped, the roof is crowned with glass towers. The peculiar museum design is characteristic for Mongolian architecture. 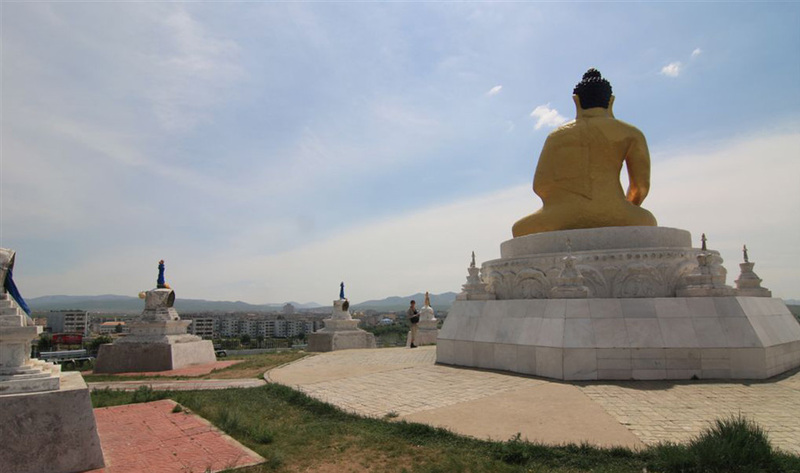 It is the second largest city in Mongolia and the capital of Darkhan-Uul Aimag. As its name implies, the city was originally conceived to be a manufacturing site for Mongolia's northern territory. 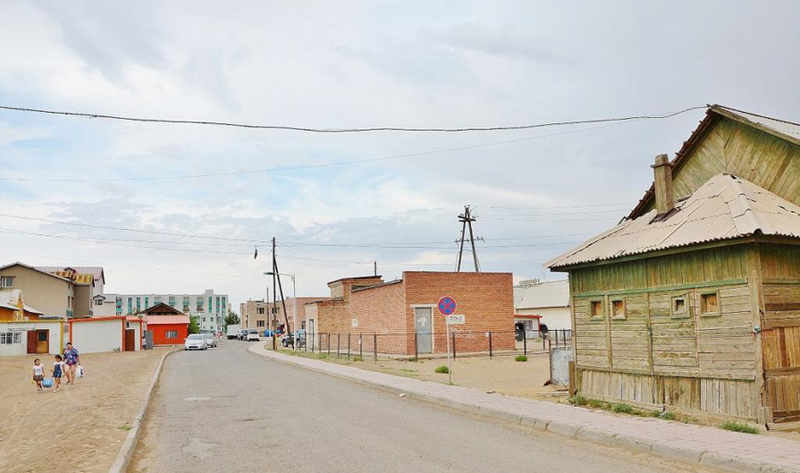 In 1961 the city of Darkhan was built with extensive economic assistance from the Soviet Union. The city remains a mostly industrial region. 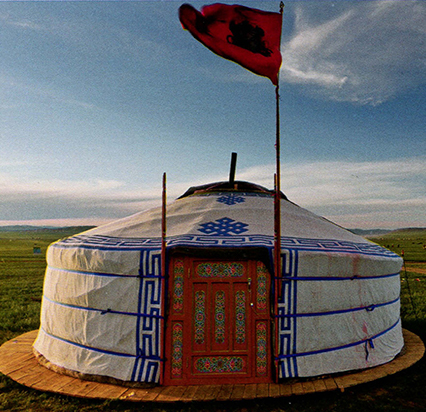 It’s interesting to know that some of the population live in yurts on the outskirts of the city. Darkhan is the second largest educational center in Mongolia. Hundreds of students come to Darkhan from other parts of Mongolia to study. The city hosts The Kharagiin monastery, which is situated in a nice log cabine in the old town. It has recently become active again as a Buddhist monastery. Museum of Darkhan-Uul, also called the Traditional Museum of Folk Art, contains a collection of archaeological findings, traditional clothing, religious artifacts, and taxidermy. You may spot a wind instrument made of a human femur and a jade chess set, but the museum's most valued piece is the original painting of Lenin meeting Sukhbaatar, a classic work of myth-making, painted by B Tsultem in 1953. The socialist monument complex at Zaisan Memorial boasts its great view over the city and honors Soviet soldiers killed in World War II. 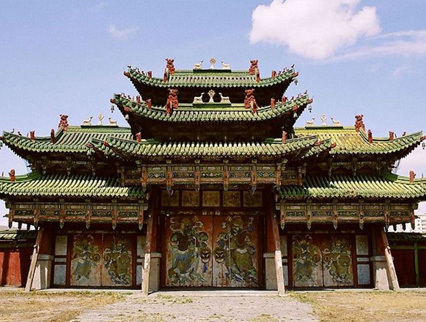 The Winter Palace of the Bogd Khan is now a museum of the last monarch. The complex includes six temples. It is one of the few Mongolian historical attractions which have neither been destroyed by the Soviets or the Communist Mongolians. On display are many of the Bogd Khan's possessions, for example a pair of ceremonial boots given to the Khan by Russian Tsar Nicholas II. Additionally, Ulaanbaatar houses numerous museums, two of the prominent ones being the National Museum of Mongolia and the Zanabazar Fine Arts Museum. 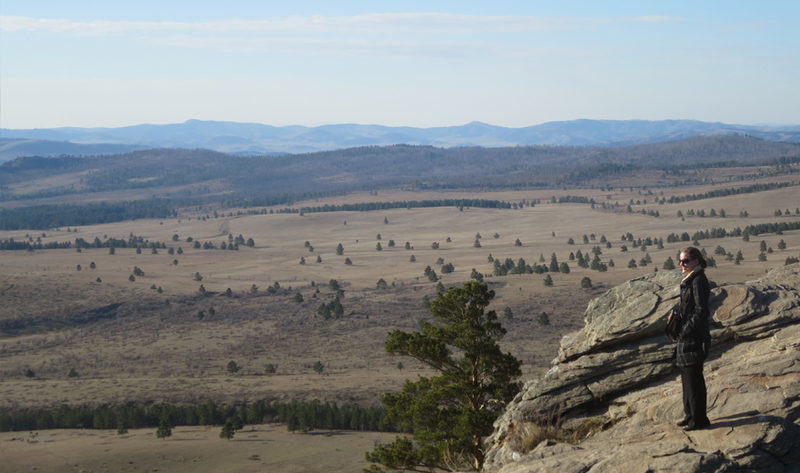 Popular destinations for day trips are the Gorkhi-Terelj National Park, the Manzushir monastery ruins on the southern flank of Bogd Khan Uul and Genghis Khan Equestrian Statue. 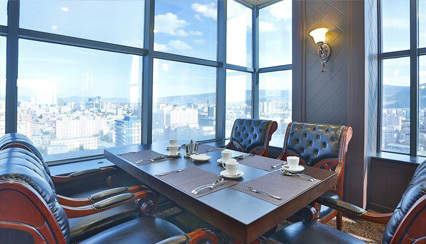 Ulaanbaatar Hotel is 3 km from Ulaanbaatar Railway Station and 300 m from Sukhbaatar Square. Guests can work out at the fitness centre, rent a car to explore the surroundings, or arrange sightseeing trips at the tour desk. The dining options on site include Ulaanbaatar Restaurant and European and Asian food at UB Bistro. 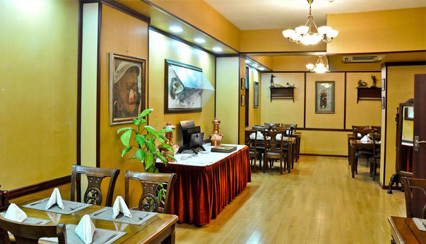 Camel Track Guesthouse is located in Ulaanbaatar, 1.1 km from Ulaanbaatar Opera House and 1.3 km from National Museum of Mongolian History. Certain units feature a sitting area for your convenience. 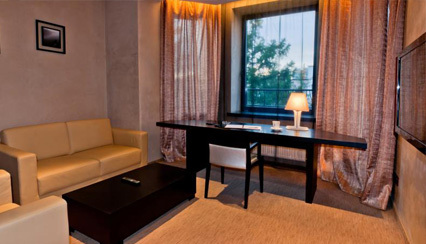 Certain rooms include views of the garden or city. Each room is equipped with a shared bathroom. It is the capital of Govisumber Province, in the east-central part of the country. Choir, about halfway between Sainshand and Ulaanbaatar, was once home to a large Russian air-force base that was abandoned in 1992 leaving behind an eerie ghost town of concrete buildings and statues of MiG fighters and also the best paved runway in Mongolia. The base is still there, although most of the buildings have been stripped to their core. 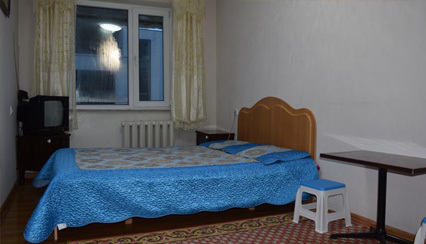 Some of the flats, which formerly housed military personnel, are now occupied by Mongolian families, but many sit empty, the windows broken. Near the railway station is a statue commemorating Mongolia's first cosmonaut, Jugderdemidiin Gurragchaa. It is the capital of Dornogovi Province in Mongolia located in the eastern Gobi desert steppe. Sainshand consists of two parts: a train station and city center 2km to the east. There is a park at the center of town. It’s surrounded by banks, hotels, restaurants and museums. Sainshand houses a museum dedicated to the nineteenth century monastic and literary figure Danzanravjaa, a prominent leader of the Nyingma school of Tibetan Buddhism. The restored Buddhist monastery Khamariin Khiid (Khamar) is 30 km south of the city. It was established in the 1820's by famous Mongolian educator and literary figure Danzanravjaa. 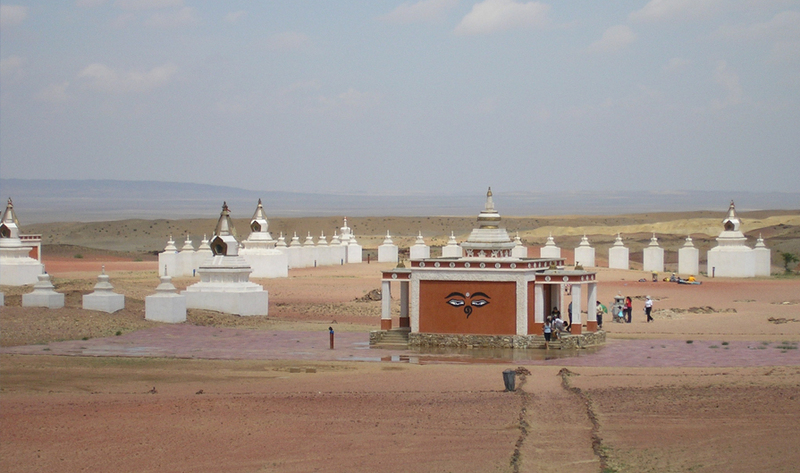 Near Khamar Monastery there is Shambala land, one of the world's energetic centers. Danzanravjaa let all his disciples gather nearby the Khamriin Hiid to make proportional drawings of the Shambala Land. They created a meditation practice land with wooden stupas, a door and a heap of stones. At that place, His Holiness uttered prayers to meet his disciples. That's why this place is known as the Shambala Land and became one of the holiest places for prostration. Khan Bayanzurkh mountain is the most famous Gobi mountain. Locals call it "wish-fulfilling mountain". If you have time on your hands, locals recommend the two-to-three-hour hike out to Khar Uul (Black Mountains), south-west of town. The town is located on the old trade route between Beijing and Urga/Ulaanbaatar, and is now the most important border crossing between Mongolia and the People's Republic of China Here you will have to present your customs declarations and immigrations forms. The border town is a rail port city and the largest hub for cross border trade between Mongolia and China. It is also variously known as Ereen or Eriyen in Mongolia, and Erenhot or Erlianhaote in China. It appears as Erlian on Chinese railway timetables, and Ereen on Monglian railway timetables. International trains change bogies in here, because of the break-of-gauge between China and Mongolia. China uses the standard gauge, while Mongolia uses the Russian 1520 mm gauge. This stop allows travelers to enjoy some of the city’s paleontological sites, such as the Dinosaur Museum. The area around the town, especially a salt lake to the east, is known for the discovery of a number of different dinosaurs. You will also find the statues of two towering Brontosauruses. 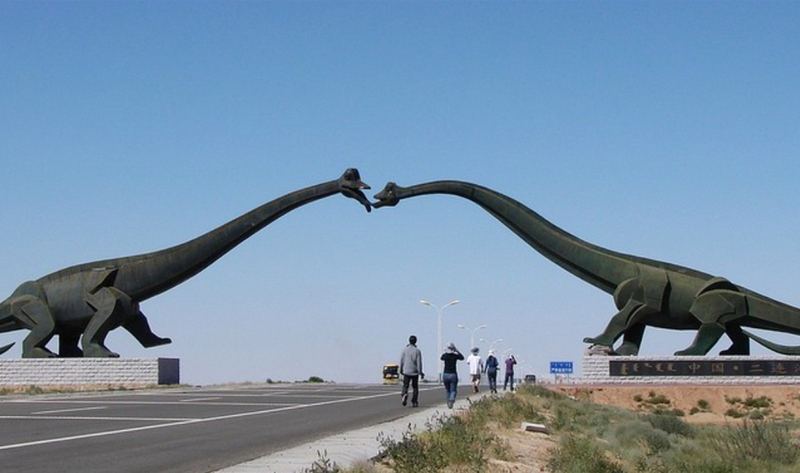 The two dinosaurs are located on either side of the main highway, their long necks stretching to the other, until the two dinosaur's mouth meet as if to share a kiss. Each dinosaur statue is 34 meters wide and 19 meters high. 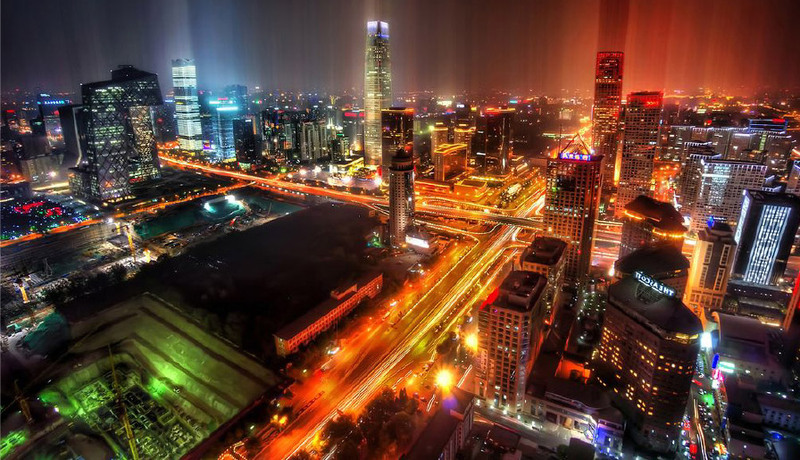 The city is the capital of the most populous country in the world, the People's Republic of China. Beijing's history dates back several thousand years, it was the seat of the Ming and Qing dynasty emperors until the formation of a republic in 1911. The Ming period was Beijing's golden era. The Forbidden City, the Temple of Heaven and many other Beijing landmarks were built in this period. The Qing built both the Summer Palace and Old Summer Palace. The capital developed into a huge city becoming the religious and cultural center of Asia. Until recently, the city was almost entirely made up of hutongs with narrow lanes and single story buildings. Now, many of the hutongs have given way to broad boulevards and modern buildings, contributing to an airy, sprawling feel. The center of the city and most important landmark is Tiananmen Square. This is the world's largest public square and a must see for all visitors. The square is surrounded by grand buildings including the Great Hall of the People, the Museum of Chinese History, the Museum of the Chinese Revolution, the Qianmen Gate and the Forbidden City. It is also home to the Chairman Mao Memorial Hall and the Monument to the People's Martyrs.